Everyone messes up in life, and authors are no exception. Words are very powerful, and authors have a duty to ensure that their words are providing goodness and not evil. Even with good intentions, authors still occasionally find ways to write stories that rub their audience the wrong way. 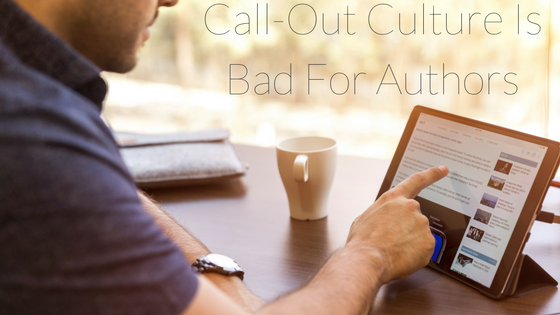 However, I want to make the case today against call-out culture, and why we all need to give authors a second chance. Call-out culture is the world we live in today, where any small mistake is scrutinized, posted on the internet, and subsequently leads to a huge mass of people calling out the perpetrator. You have seen this happen with celebrities, everyday people, and, yes, even authors as well. The biggest site where you will find call-out culture is Twitter, although every social media has some aspects of it. Why is call-out culture bad? Embracing a society where we take every infraction and turn it into a time for public ridicule and (often) punishment is treading very close to North Korea territory. Yet, the problem with call-out culture is that the infractions are most frequently not law violations, but rather, infractions of rules placed on us by our peers. For example, someone who says a racial slur will most likely be called out. This isn’t illegal, but I agree that it is definitely immoral. The problem with call-out culture is that its effects are long-term and can result in people getting fired, expelled, or having their reputation tarnished. Furthermore, people are constantly getting called out over mistakes they made several years ago, or over words that are taken out of context. How does call-out culture affect authors? Authors have it rough, especially if they write young adult fiction. In society today, it is extremely difficult to write a work of fiction without having everyone scrutinize you for how inclusive your writing is. Or, if you try to be inclusive, people often claim that you are being prejudiced for telling a story that you have not experienced firsthand. Either way, you are sure to get called out, and your reputation may be ruined, even if your book was perfectly reasonable to an average person. How can we stop call-out culture? The biggest step is to stop partaking in it. If you see someone getting called out online, do research for yourself to determine whether it is justified or not. Do not rely on news sources (which have recently overlooked accuracy for timeliness), and definitely don’t rely on random people on the internet. Otherwise, encourage others to practice forgiveness, particularly if the offender has apologized, and to stop destroying lives because of one mistake. Although I do not condone any illegal actions and do not want people to feel attacked, call-out culture has gone too far recently. Authors are struggling to write works that accurately represent them, without stepping on the toes of people who get offended easily. I believe that we will see some great artists share their work if we allow them to make mistakes and learn from them, rather than expecting everyone to be perfect. Next time you see someone being called out online, I suggest looking further into the story and determining whether or not you think they should be called out.